In this Shop Talk Blog post, we are going to look at 7 of the world’s largest excavators and consider them by the numbers. 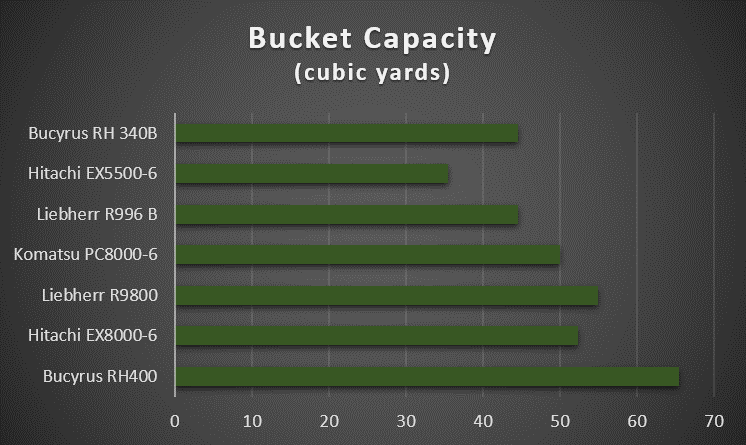 We’ve included several charts so you can get a quick idea of how they compare in terms of weight, bucket capacity, gross horsepower, track length, and more. Have any of you guys ever worked with one of these monsters? Tell us in the comments! Any one of these machines will be significantly bigger, more powerful, and more productive than your run-of-the-mill hydraulic excavator or hydraulic shovel. They were made for massive jobs and rugged conditions, and most of them are used in mining. As you can see in the table above, many of these massive excavators use Cummins diesel engines, with the exception of the Komatsu PC8000-6 (Komatsu brand) and the Bucyrus RH 340B (Caterpillar brand). While these machines use many different types of buckets, they are all either rock shovel, bottom dump, or backhoe-style buckets. Of these, the Komatsu PC8000-6 holds the maximum travel speed at 1.5 mph, and the Bucyrus RH400 holes the maximum swing speed at 4 rpm. 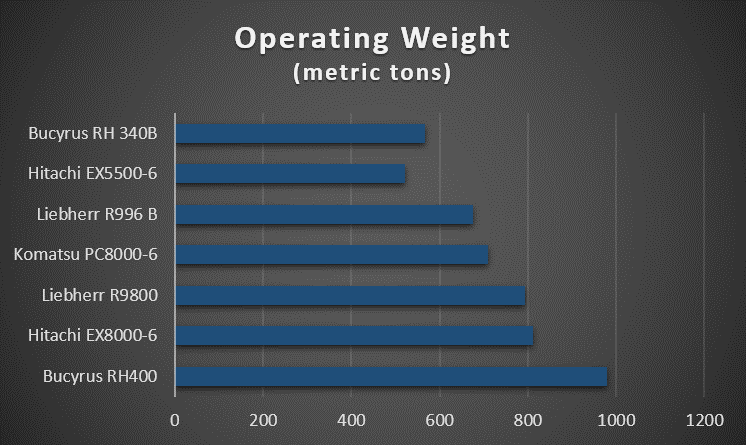 The title of heaviest belongs to the Bucyrus RH400, which weighs in at an operating weight of 908 metric tons. The lightest machine in this list (as if the term "light" even applies to the weight of any of these excavators) is the Hitachi EX5500-6, weighing in at a mere 522 tons. 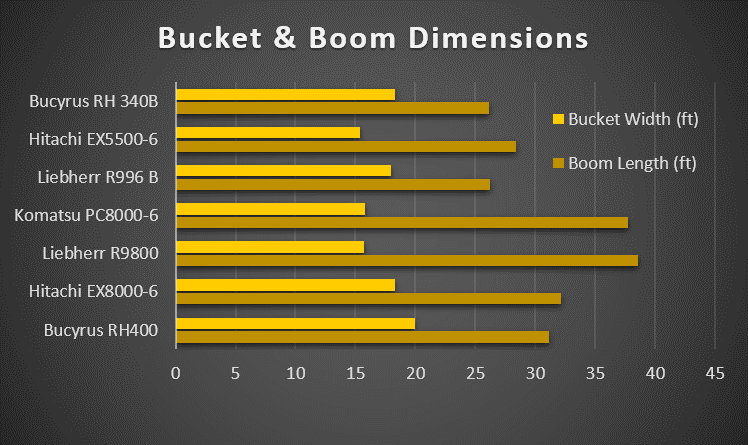 It's interesting to note that there seems to be little correlation between bucket width (bright yellow) and boom length (bright gold) in the chart above. The longest boom, belonging to the Liebherr R9800, measures at about 39 feet; the widest bucket, belonging the Bucyrus RH400, has a width of 20 feet. 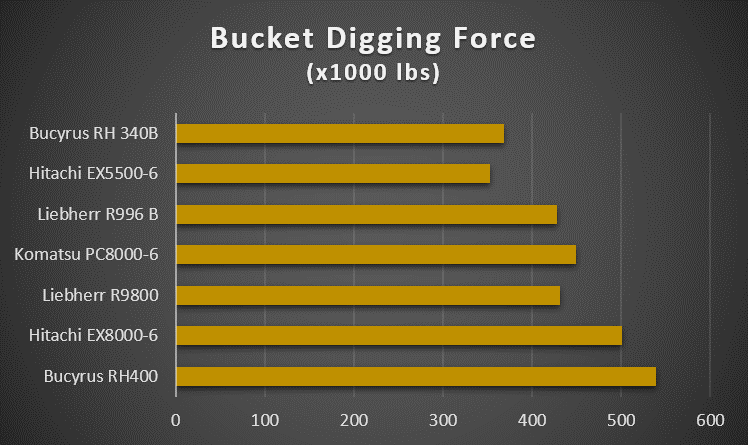 The winner of widest bucket, the Bucyrus RH400, also has the largest bucket capacity: 65.4 cubic yards with a rock shovel. The Hitachi EX5500-6 has the smallest bucket capacity: 35.5 cubic yards with a bottom dump shovel. Once again, the Bucyrus RH400 has another "largest": a bucket digging force of 539,000 pounds. The smallest is the Hitachi EX5500-6, with only 353,000 pounds. That's sure more than you could get with a mini-excavator! 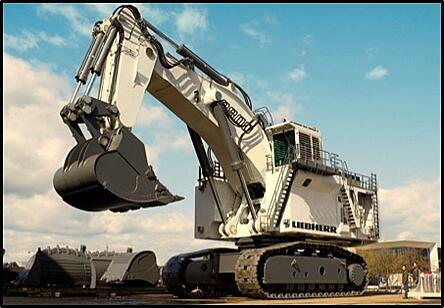 The Liebherr R9800 has the largest fuel tank capacity, allowing it to hold 5,202 gallons of diesel. 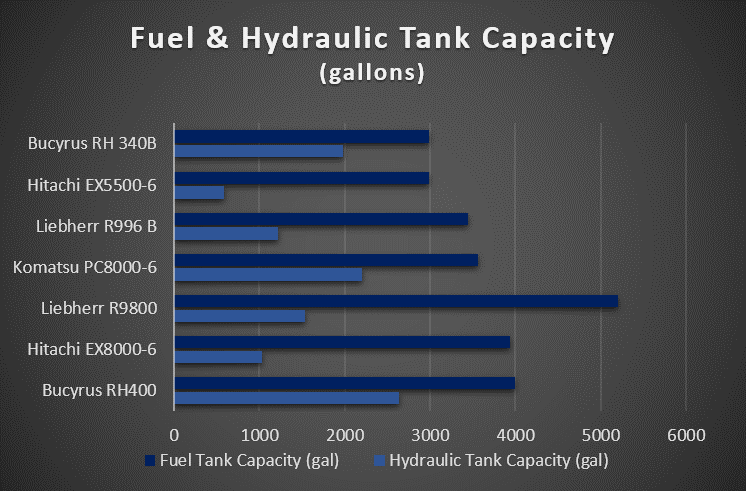 The largest hydraulic tank can be found on the Bucyrus RH400, which will hold 2,640 gallons of hydraulic fluid. Just filling one of these up at the start of a shift must take quite a while! 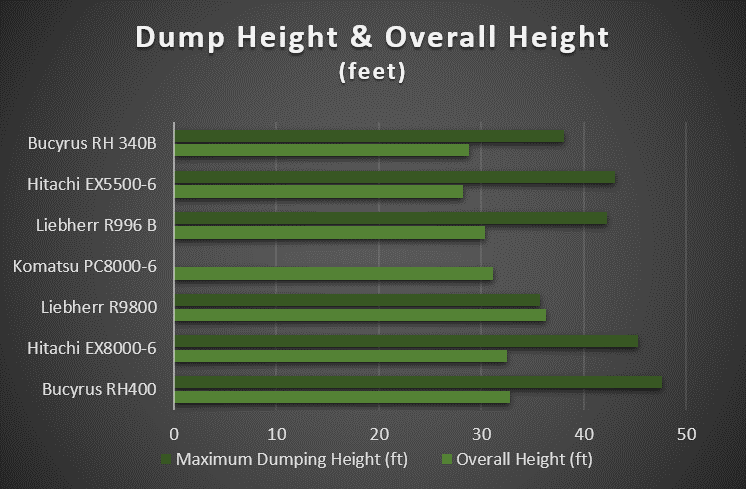 The Bucyrus RH400 has the highest dump height at almost 48 ft; the Liebherr R9800 has the shortest dump height at only 35.75 ft. As for overall height, the tallest machine is the Liebherr R9800 which is a little over 36 feet tall. The shortest machine in this group is the Hitachi EX5500-6 at just a little over 28 feet tall. 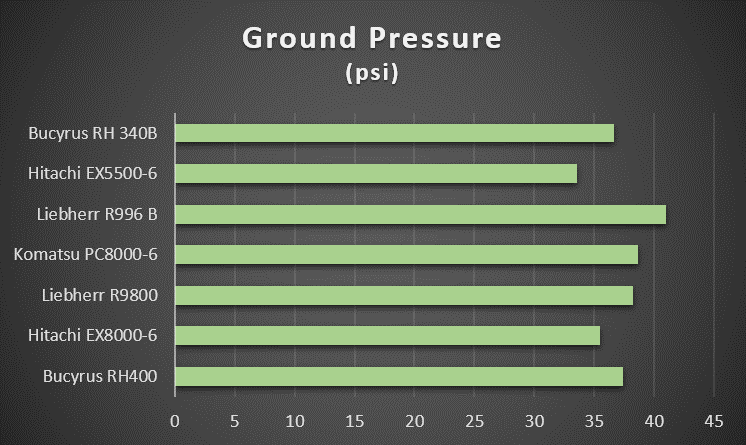 The smallest amount of ground pressure is exerted by the Hitachi EX-5500 at just 33.6 psi. The Liebherr R996 B exerts the greatest ground pressure at almost 41 psi. Everyone loves a monster machine, and hydraulic excavators and shovels are certainly no exception. These are not the kind of machines you would use to excavate your typical residential basement or pool -- that's for sure! So, who'd love the opportunity to operate one?